Brisket Sandwich at Da Bomb BBQ in Revere. IN THE KITCHEN Like a growing number of local restaurants, Da Bomb BBQ was born on wheels. 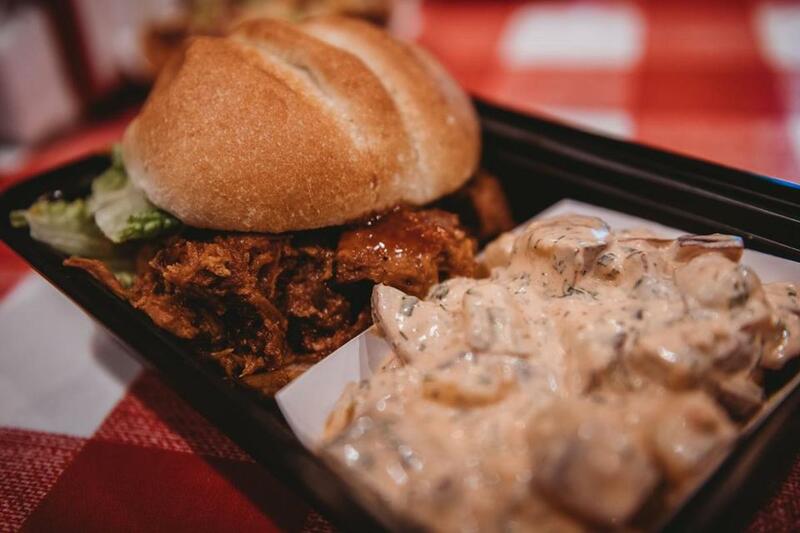 Da Bomb BBQ food truck was launched about a year and a half ago by Meaghan Fitzgerald and Chad Schaeffer, who quickly followed up with a restaurant on Broadway in Revere. The concept and menu are entwined with the story of how Fitzgerald and Schaeffer met and wed — the stuff of a country-western song. Fitzgerald, who grew up in the Boston area, has had a long history of working in the food industry, including for her parents’ restaurant, but as a restless 20-something, she headed west to work on a Wyoming guest ranch for the summer. Set up on a blind date, she met the man who would become her husband (an engineering student, not a cowboy) and decided, “I wasn’t coming home.” She moved with him to Butte, Mont., where she worked in hospitality and he finished his degree. Years later, she convinced him to move back to Boston for greater engineering job opportunities and she returned to working for her parents. The pair had frequently talked about opening a food truck and Schaeffer missed Montana-style barbecue. So using recipes from Schaeffer’s mom, the pair launched Da Bomb BBQ Food; the name is based on “bombs” or rounded pastries filled with savory ingredients, a favorite Montana dish. THE LOCALE The pair now lives in Revere and converted the site of a former Peruvian restaurant into a Montana oasis. Country-western music greets you when you walk into the cheerful space, with red-and-white tablecloths, country kitsch on the walls, and a blood-orange neon sign announcing BBQ in the window. The urban touch comes from the graffiti-style logo for “Da Bomb,” a design that almost looks splattered on the wall, or tagged by a rib-loving street artist. The logo is the work of artist George Dimitrov; Fitzgerald loved his work and contacted him about creating a logo. There’s seating for 28 and an outside patio, which on our visit, was occupied only by two stalwart snowmen. ON THE MENU Da Bomb features Montana-style barbecue — there’s no mustard or vinegar in the recipes; the dishes are heavy in brown sugar, peppers, and spice. “It’s food you didn’t know you were missing and craving until you eat it,” said Fitzgerald. The “bombs” here include the BBQ Pulled Pork Bombs ($9), topped with coleslaw, bacon and house beer BBQ, and Chicken Pickle Bombs ($9), topped with melted cheddar, bacon, and smoky aioli. You can order smoked chicken wings ($8) with a choice of sauces: Coke BBQ, Beer BBQ, Coffee BBQ, Spicy Cowboy BBQ, or Buffalo. On our visit, we kicked things off with the appetizer of Loaded Tots ($6), topped with melted cheddar, bacon, scallions, and Sriracha ranch sauce. Naturally, there are ribs — we sampled the BBQ Ribs ($15, $20), which were roasted with a dry rub and glazed with Coffee BBQ, which gave the tender, flaky meat an excellent flavor. We also sampled the bacon-wrapped smoked chicken ($17), which was disappointing as the chicken was too dry, even wrapped in bacon. Popular items are the BBQ Brisket ($17) and the BBQ Brisket Sandwich ($11.) You get two sides with the specialties and one side with sandwiches. On Fitzgerald’s recommendation, we opted for a side of creamy coleslaw and it turned out to be a standout, both tart and luscious. The garlic smashed potatoes were soothing, and Smoked Bacon Braised Baked Beans were hearty with an unusually rich flavor. Another of our favorites was the delectable Baked Brewsky Mac and Cheese (you can also order this as a meal ($13) and opt to add pork or chicken). Da Bomb offers take out, delivery, and catering. It’s a bit of the West in the backcountry of Revere with a streetwise moniker. Da Bomb BBQ, 744 Broadway, Revere, 781-629-1497, www.DaBombFood.com. Stephanie Schorow can be reached at sschorow@comcast.net.